forward fruit aromas and flavors while those fermented and/or aged in barrels absorb wood, vanilla, baking spice, and other character from the oak. As finer varietally labeled wines found their way into more and more American homes in the 1980s and 1990s, popular wine critics heaped praise on the super-lush Chardonnay of California and Australia. Those critics with their constantly challenged (maybe fried) palates seemed to only savor wines that were amped up with super-ripe fruit, high alcohol and heavy-handed use of oak barrels and other winemaking techniques. And for a time, the consumer bought in. Through the 1990s the buzzwords in California Chardonnay were barrel fermented, barrel aged, new oak barrels combined with the winemaking technique malo-lactic fermentation lending richness and mouth filling vanilla, butter and creaminess. None of these flavors come from the Chardonnay grape. This became the fashionable style particularly from New World wine producing regions. Wines made in a more subtle style were considered to be simple and uninteresting. How did this big, fat style of Chardonnay production become fashionable? We have the French to blame. Burgundy is the ancient and traditional home to the worlds most renowned Chardonnay-based table wines. New World winemakers were attempting to emulate the legendary Montrachets and Meursaults of the Côte dOr; and with good reason. These white Burgundies were and continue to be wines of great finesse, complexity and longevity, especially in the finest vintages. In Burgundy, barrel fermentation and aging and malo-lactic fermentation are standard practices for the finest wines. But in this very cool and weather-challenged region Chardonnay grapes struggle to fully ripen, producing fruit with low sugar levels (therefore lower alcohol in the finished wine) and high acidity. This fruit could stand up to the use of tight-grained French oak barrels absorbing subtle complexity rather than harsh woodiness. .Malo-lactic fermentation is practically a necessity to tone down the tart acidity. The warmer New World wine regions produce much riper fruit with high sugars (and high alcohol) and lower acidity. This kind of fruit subjected to an intense oak regimen, particularly the more open-grained American oak, is often woody, overwhelming the beautiful lush fruit character that is inherent to the Chardonnay grape. Malo-lactic applied to wine already lacking in acid structure just becomes flabbier with the powerful buttery aroma of the ML byproduct diacetyl. These wines can be very flavorful but without the structure and balance the finest Chardonnays are capable of expressing. Along came Pinot Grigio. In the 1980s, a Northern Italian producer, Santa Margherita, became a wine list darling with their crisp, floral, food-friendly, unoaked style of this variety more well known to connoisseurs as Pinot Gris from Alsace. The popularity of Pinot Grigio quickly spread to all segments of the trade and to a wide consumer base with value priced versions. A wave of ABC (Anything But Chardonnay) backlash ensued, especially as fat, over-oaked Chards became unfashionable. Soon, aromatic varietals from around the world were in demand as sommeliers and fine wine shops began recommending crisp, food friendly aromatic varieties to their customers. Long-cultivated Old World wines from Gruner Veltliner of Austria, Cortese of Gavi in the Italian Piemonte, Pinot Gris and Gewürztraminer of Alsace, to Spanish Albariño all became belles of the ball. Even Riesling, maligned as the insipid sweet stuff of Liebfraumilch infamy, regained favor in crisp, flinty, dry styles from Germany and Alsace. And New World producers jumped on the bandwagon with Pinot Gris from Oregon, Torrontés from Argentina, even bone-dry Riesling from Australia. But the big surprise was the explosion of the lovely grapefruit and gooseberry scented  and purposefully unoaked - Sauvignon Blancs from a relative newcomer to the fine wine scene, New Zealand. New Zealand, like all New World regions has a great deal of Chardonnay planted but recognized that their customers were less interested in oak flavor than the fresh fruit flavors of the grape. New Zealand winemakers are not the first to produce unoaked Chardonnay. The great (often overlooked) Chardonnays of Burgundys Chablis region are rarely exposed to oak. 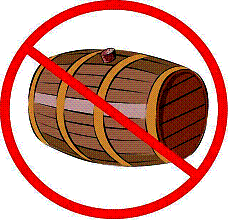 Value priced wine producers around the world have long eschewed barrels because of the cost involved. But the New Zealanders were first to embrace it on a broad scale for their finest Chardonnays. The wines have been well received by critics and consumers alike applauding the delightful fresh fruit character and crisp acidity. One of the better known and widely available is from Kim Crawford winery which has been producing its Unoaked Chardonnay for ten years and has been exporting to the US for the past eight years, now selling over 20,000 cases each year. Today, many California winemakers are on board the unoaked Chard bandwagon. Toad Hollow of Sonoma began producing this style since 1993 with a run of 3000 cases. Production of the 2006 vintage is nearly 50,000 cases. St. Supery of Napa Valley began producing Oak Free Chardonnay for its tasting room in 2003. The wine was such a runaway hit that they have stopped producing barrel fermented Chardonnay altogether. Marimar Torres of Sonoma began production in 2005 of her unoaked Chardonnay Acero (steel in Spanish) and tripled production to 3000 cases with the 2006 vintage. The Wagner family of Caymus Cabernet Sauvignon fame has produced one of Californias most winemaker driven Chardonnays (lots of oak, ML, lees aging, et.al.) at Mer Soleil from beautiful Santa Lucia Highlands fruit. In 2006 Charlie Wagner produced a second Chardonnay, the unoaked Silver which showcases the brilliant fruit and acid structure the region is capable of producing. In Oregon, respected Willamette Valley producer Chehalem bottled 3000 cases of their version called Inox. Even the Aussies have seen the light with the popular brand Wishing Tree selling nearly 10,000 cases per year of their unoaked Chardonnay. While many examples of outstanding oak flavored Chardonnays exist, the trend toward unoaked versions may have some staying power. Especially the way sales of these fruit and acid driven wines are concerned. And winemakers are not unhappy to eliminate the great expense of barrels and aging wine. With those two powerful forces at hand, expect to see many more examples on your local shelf and wine list.